Product #22140 | SKU TS-RDP8K | 0.0 (no ratings yet) Thanks for your rating! 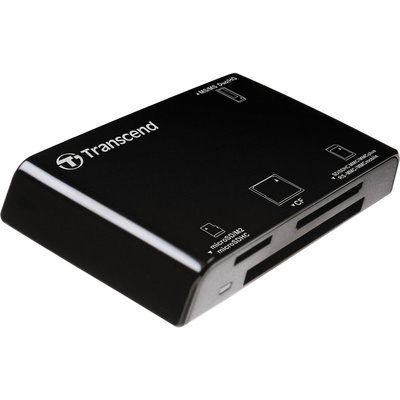 The black Multi-Card Read P8 from Transcend is compatible with sixteen different card formats to provide rapid and easy transfer of data from your camera to your computer. This plug-and-play device has clearly labelled card slots so there is never a problem knowing which card goes where. Each P8 Card Reader comes with free RecoveRx software that features quick and easy previews of recoverable data. This useful software can help users easily restore lost or damaged files with just a few mouse clicks. At a little more than an ounce and with its thin design, you can tuck this unit into your pocket, gear bag accessory pocket or just leave it next to your computer where it won't take up any space.